The geological time scale divides the history of the Earth into units of time based on layers of rock (strata). It is at the very foundation of earth science. Paleontologists use it to date when various species lived. This chart is essential to the study of both earth and life science. 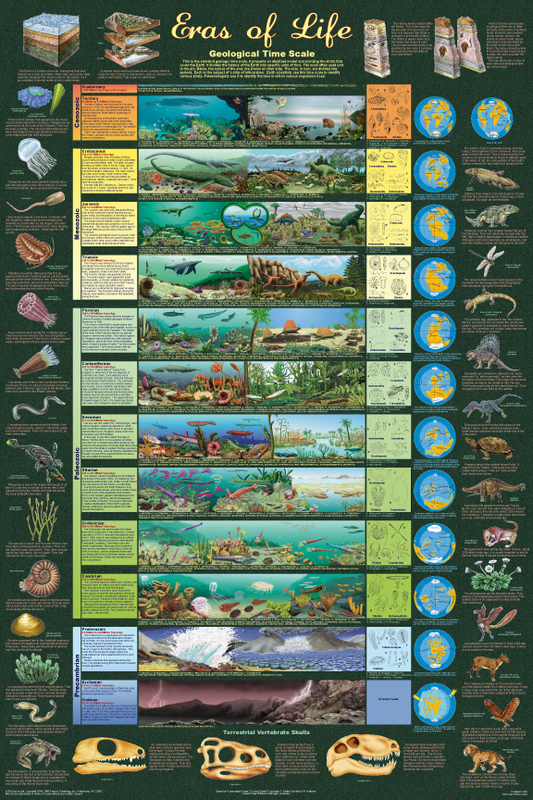 This poster presents each period of geological time through a strip of illustrations. Each period is introduced by informative text, followed by illustrations showing life both on land and in the seas, index fossils and a globe showing the position of the continents. This new edition incorporates an abundance of additional information and illustrations. An introduction now explains what the geological time scale is, its significance and how it was created. The margins now introduce important groups of animals and plants. They complement the period illustrations that show how the species within the groups changed over millions of years. Updated graphics make it even more attractive. This has long been one of our most popular titles and this major revision makes it even more informative and useful. Highly educational and perfect for display in classrooms, homes, offices, laboratories and just about anywhere that learning takes place. This 24" X 36" poster is printed on heavy, acid-free paper using non-fade inks, then coated to reduce glare and provide protection from scratches. The names of organisms and stratigraphic stages follow international nomenclatures.